Henry More FRS (; 12 October 1614 – 1 September 1687) was an English philosopher of the Cambridge Platonist school. Henry was born at Grantham and was schooled at The King's School, Grantham and at Eton College. Both his parents were Calvinists but he himself "could never swallow that hard doctrine." In 1631 he entered Christ's College, Cambridge, at about the time John Milton was leaving it. He took his BA in 1635, his MA in 1639, and immediately afterwards became a fellow of his college, turning down all other positions that were offered. 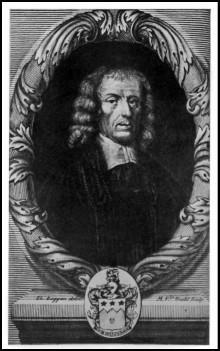 He would not accept the mastership of his college, to which, it is understood, he would have been preferred in 1654, when Ralph Cudworth was appointed. In 1675, he finally accepted a prebend in Gloucester Cathedral, but only to resign it in favour of his friend Dr. Edward Fowler, afterwards bishop of Gloucester. More taught many notable pupils, including Anne Finch, sister of Heneage Finch, subsequently Earl of Nottingham. She later became Lady Conway, and at her country seat at Ragley in Warwickshire, More would spend "a considerable part of his time." She and her husband both appreciated him, and amidst the woods of this retreat he wrote several of his books. The spiritual enthusiasm of Lady Conway was a considerable factor in some of More's speculations, even though she at length joined the Quakers. She became the friend not only of More and William Penn, but of Franciscus Mercurius van Helmont (1614–1699) and Valentine Greatrakes, mystical thaumaturgists of the 17th-century. Ragley became a centre of devotion and spiritualism. More was a rationalist theologian. He attempted to use the details of 17th-century mechanical philosophy—as developed by René Descartes—to establish the existence of immaterial substance. More (1712) rejected Cartesian dualism on the following grounds: "It would be easier for me to attribute matter and extension to the soul, than to attribute to an immaterial thing the capacity to move and be moved by the body.' His difficulties with Cartesian Dualism arose, not from an inability to understand how material and immaterial substances could interact, but from an unwillingness to accept any unextended entity as any kind of real entity. More continues "...it is plain that if a thing be at all it must be extended." So for More 'spirit' too must be extended. This led him to the idea of a 'fourth dimension" in which the spirit is extended (to which he gave the curious name of "essential spissitude") and to an original solution to the mind-body problem. A quotation from More is used as the epigraph of Ralph Waldo Emerson's "The Over-soul." He was a prolific writer of verse and prose. The Divine Dialogues (1688), a treatise which condenses his general view of philosophy and religion. Like many others he began as a poet and ended as a prose writer. His first work, published in 1642, but written two years earlier, was entitled Psychodoia Platonica: or, a Platonicall Song of the Soul, consisting of foure severall Poems. This was followed in 1647 by his full collection of Philosophicall Poems, which includes The Song of the Soul,' much enlarged, and is dedicated ' to his dear father.' A second edition was published in the same year, and it was included by A. B. Grosart in his Chertsey Worthies Library (1878). Observations upon Anthroposophia Theomagica and Anima Magica Abscondita by Alazonomastix Philalethes, 1650 ; in answer to Thomas Vaughan, who replied in The Man-mouse taken in a Trape. The Second Lash of Alazonomastix, a rejoinder to Vaughan, 1651. An Antidote against Atheism, or an Appeal to the Naturall Faculties of the Minde of Man, whether there be not a God, 1653 : 2nd edit. 'corrected and enlarged: With an Appendix thereunto annexed,' 1655. Conjectura Cabbalistica ... or a Conjectural Essay of Interpreting the Minde of Moses, according to a Threefold Cabbala: viz. Literal, Philosophical, Mystical, or Divinely Moral, 1653; dedicated to Ralph Cudworth. Enthusiasmus Triumphatus, or a Discourse of the Nature, Causes, Kinds, and Cure of Enthusiasme; written by Philophilus Parrasiastes, and prefixed to Alazonomastix his Observations and Reply, &c., 1656. The Immortality of the Soul, so farre forth as it is demonstrable from the Knowledge of Nature and the Light of Reason, 1659; dedicated to Viscount Conway. An Explanation of the Grand Mystery of Godliness; or a True and Faithful Representation of the Everlasting Gospel of our Lord and Saviour Jesus Christ, 1660. A Modest Enquiry into the Mystery of Iniquity, and an Apologie, &c., 1664. Enchiridion Ethicum, praecipua Moralis Philosophiae Rudimenta complectens, illustrata ut plurimum Veterum Monumentis, et ad Probitatem Vitae perpetuo accommodate, 1667, 1668, 1669, 1695, 1696, and 1711. Divine Dialogues, containing sundry Disquisitions and Instructions concerning the Attributes of God and His Providence in the World, 1668. The most authentic edition appeared in 1713. An Exposition of the Seven Epistles to the Seven Churches; Together with a Brief Discourse of Idolatry, with application to the Church of Rome. The title of the latter in the volume itself is An Antidote against Idolatry, and it elicited from More in reply to attacks A brief Reply to a late Answer to Dr. Henry More his antidote against Idolatry, 1672, and An Appendix to the late Antidote against Idolatry, 1673. Enchiridion Metaphysicum: sive, de rebus incorporeis succincta et luculenta dissertati; pars prima, 1671, an attack on Cartesian philosophy, which he had in earlier life admired. Remarks upon two late ingenious Discourses [by Matthew Hale]; the one, an Essay, touching the Gravitation and non-Gravitation of Fluid Bodies; the other, touching the Torricellian Experiment, so far forth as they may concern any passages in his "Enchiridion Metaphysicum," 1676. Apocalypsis Apocalypseos; or the Revelation of St. John the Divine unveiled: an exposition from chapter to chapter and from verse to verse of the whole Book of the Apocalypse, 1680. A Plain and continued Exposition of the several Prophecies or Divine Visions of the Prophet Daniel, which have or may concern the People of God, whether Jew or Christian, &c., 1681. A Brief Discourse of the Real Presence of the Body and Blood of Christ in the Celebration of the Holy Eucharist; wherein the Witty Artifices of the Bishop of Meaux [Bossuet] and of Monsieur Maimbourg are obviated, whereby they would draw in the Protestants to imbrace the doctrine of Transubstantiation, 1681. The chief authorities for his life are R Zimmermann, Henry More und die vierte Dimension des Raums (Vienna, 1881); Henry More: Tercentenary Studies, ed. by Sarah Hutton (Dordrecht, 1990). ^ Henry, John, "Henry More", The Stanford Encyclopedia of Philosophy. ^ Vermeir, K. (2008) ‘Imagination between Physick and Philosophy. On the Central Role of the Imagination in the Work of Henry More (1614–1687).’ in Intellectual History Review, 18 (1), 119–137. ^ a b c d Dictionary of National Biography; More, Henry (1614–1687). Aharon Lichtenstein, Henry More: The Rational Theology of a Cambridge Platonist Cambridge: Harvard University Press, 1962. S. Hutton (ed.) Henry More (1614–1687): Tercentenary Studies Dordrecht: Kluwer Academic Publishers, 1990. D. Hedley and S. Hutton (ed.) Platonism at the Origins of Modernity Dordrecht: Springer, 2008. Ryan Stark, Rhetoric, Science, and Magic in Seventeenth-Century England. Washington, DC: The Catholic University of America Press, 2009, 99–101.